The importance of using a 4 Gas Analyser in diagnosing suspected Catalytic Converter faults has again been highlighted by the EEC Team. Our Dedicated Technical Trainers have been working with a Swedish customer on one particular fault found on a BMW 3 Series. After replacing the OE catalytic converter with our BM6001T part, the engine light continued to come on and the car was reporting as “fault code cat below efficiency”. 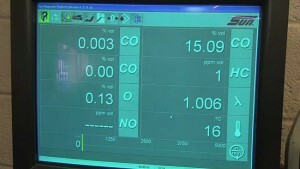 By using the readings from a 4 gas analyser test, all the values were identified as correct with the exception of the o2. From this particular reading, we diagnosed that the joint directly behind the catalytic converter had not been sealed correctly and air had entered the exhaust system. With the rear lamda sensor being located near this joint, it had picked up the o2 and switched on the engine management light. The customer in Sweden came back and said they had “checked the connection and sure enough found a leak between the catalyst and the muffler”. Throughout our 40 year history, European Exhaust and Catalyst has been committed to supporting our customers with technical support. We pride ourselves on an educational approach to our work, with an extensive Technical Training programme for the aftermarket, including certification. This knowledge is available for all stakeholders through our regular emails, technical blog and social media. For more information, please call our technical team on +44(0)23 9224 5300.